Claudia is a privileged teenager growing up in what appears to be a post-apocalyptic world. There are computers and advanced technology, yet it has been mandated that people live according to "protocol" - as though they were in the 17th century. Her father is the Warden of a most unusual social experiment, a prison known as Incarceron, and Claudia has been groomed her entire life to wed the son of the ruler of their land. She is under no illusions about any sort of loving relationship she might have with the prince, a feckless, self-involved young man who has just been kicked out of his exclusive private school. She just didn't expect the news that that they'd have to get married so very soon. 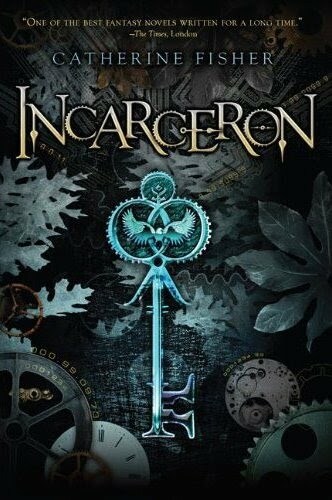 Finn is a teenager who woke up one day in a cell in Incarceron with no memory of his past. He is known as the star seer because he claims to be from outside the prison, and to have occasional, elusive memories of having seen the stars. He and Keiro, his blood brother, survive the best they can in the lawless, brutal world of Incarceron. When he discovers a crystal key that has the same design as the tattoo on his wrist, and Claudia finds a similar key among her father's belongings, she and Finn are able to communicate with each other. Everything they've held to be true is suddenly called into question. While only one person has ever been said to have escaped Incarceron, Claudia is determined to help Finn escape as well - only there is much more to the prison than they know, and the price to be paid for the truth is much higher than they expect. I listened to the audio version of this book, and while it took some time for me to come to care about the characters and their situation, once that happened, the book became quite gripping. I am a little unclear why the audio reader chose to narrate the book with an American accent but give all the characters English accents - I found it a bit distracting until I became used to it. 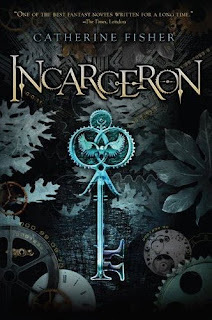 I loved the idea of Incarceron, and the reasons behind it, and the fascinating society that Fisher creates. There are lots of intriguing "what if" questions raised and answered (some only partially), and I always enjoy that aspect of speculative fiction. We learn that Claudia has been taught all kinds of things - martial arts, including fencing, political strategy, all things relating to the protocol of the era in which they pretend to live - so I was expecting her to be a bit more feisty as well as a skillful diplomat, but often she just blurted things out like an unsophisticated teenage girl, so I never felt that I really had a good grasp of her character. I did like Claudia, as well as Finn, but they weren't half as interesting as some of the minor characters, which may be why it took me a while to warm up to them. All in all, I enjoyed this book, and I am planning to read its sequel, Sapphique, because I just have to know what happens next! Beyond Books: "Around half-way through the book I got hooked. As the action and suspense built up I became much more interested in the lives of Finn and Claudia." A Chair, a Fireplace & a Tea Cozy: "Because there are two narratives, two stories, there is a fairly large cast of characters. Each one is fully drawn; very real..."
Fantasy Book Critic: "From the moment I started reading this book, it sucked me in and it was almost impossible to put down." Sleep. Eat. Read: "I found Incarceron to be one of the most imaginative books I've ever read. Fisher's world building is incredible..."
Thanks for the suggestion! This sounds really interesting. The narration of the audio book sounds like it would have irritated me to no end. And as you saw from my review, it also took me a while to get to know and care about these characters. Oddly the same thing happened in the sequel!! Trisha - My pleasure. I hope you enjoy it! Ladytink - I agree. I had to laugh at one part of the book when Claudia tells her maid that she knows they have washing machines hidden downstairs, so she should stop complaining about the state of Claudia's clothing! Cat - the reader was great, but yes, the accent thing - what was up with that? Does the sequel focus on the same two main characters? I think I'll take a break before reading it - and I think I'll give the audio version a pass. The sequel focuses on Finn & Claudia in some chapters and Attia & Keiro in the others. So it's still the inside/outside thing but with more characters. I think I liked the first book much better. My kind of book! I have to wonder why I love reading about these horrible futures so much! This was one of my favorite reads so far this year (even if it took a while to wrap my head around and figure out how to review). Cat - Interesting. Do you think it's worth continuing with the second book? Joanna - I know just what you mean! Missprint - This was a hard one to review, wasn't it? There's just so much to the book, so it's hard to describe without giving too much away. I just finished reading the book and really enjoyed it. Like you it took me a bit to get into it, but once I did the plot picked up for me. Fisher's world building is great. Rachel - I'm glad you enjoyed it too! I agree - her world building is very effective. Are you planning on reading the second one? I am planning on reading the second one. Although I can't say that I'm as excited about it. Usually I prefer a first person narrative; and although I can get on board with the third with the focus on two characters, Sapphique sounds like it's going to be split up into so many characters! Rachel - those are my exact misgivings. Unless it's done really well, I spend too much time wishing I were with my favorite character(s) and rushing through the parts from the POVs of characters I'm not as interested in. We'll see how it goes.